I haven’t been very good about blogging lately (as well as taking non-baby pictures, so please excuse the lack of pictures in this post). My training for the LA Marathon isn’t stellar, that’s okay though. I’ve accepted that the race will just be a fun-do-not-get-injured-really-really-long run. I’m so exhausted most days and in my down time, I am either trying to sneak in a couple of hours (or in most cases 30 minutes) of work or watching mindless television. There are still a number of posts that I’d like to share and some that I have promised to share for a while but haven’t gotten around to it yet — i.e. my review on the Plantronics BackBeat Fit Bluetooth Headphones. And now to add to that list, I am wearing a Garmin Forerunner 35 all the time even when I am not running. Wonder what happened to my Apple Watch or the Garmin Forerunner 220? Well, I guess you’ll have to wait patiently for me to write up that post! However, in other news, I ran my first official half marathon postpartum on Sunday. This was also my first NYCRUNS race ever. So on Sunday, I ran the Central Park Half Marathon. The course was slightly different from that of other Central Park half marathons that I have run. Instead of two full loops of the park, this one was two loops from Harlem Hill to the 72nd Street transverse and a partial third loop ending at 102nd Street on the East Side. In my one race experience with NYCRUNS, they are very different from NYRR. The races are not nearly as crowded even when they sell out. Also, the races do not sell out far in advance. In the example of this one, the race didn’t sell out until the day before and the field was less than 2,000 people where in the case of a comparable NYRR half marathon, the race would have been sold out further in advance and there would be likely nearly double the amount of people and in some cases way more. As a result, bib pickup and the logistics are not nearly as elaborate. The bib pickup for this race was at Paragon Sports the day before and available morning of the race up to 30 minutes before the start. I opted for morning pickup and the process was smooth. There were barely any lines and while the pickup didn’t use any fancy technology like NYRR uses now with the QR codes, it was still efficient. After bib pickup, I waited on line for the port-a-potties which were not available near the start area (96th Street and West Side) instead were all at the finish area (102nd Street transverse). From there I picked up my race t-shirt and dropped off my bag. I jogged over to the start area (since when I did become one of those obnoxious runners that I used to make fun of who ran before races?) and had over 20 minutes to spare before the start. There were no corrals and everyone just hung out while waiting for the start of the race. As I was starting the race (about 3 minutes after the gun went off), I was thinking about how if you’re someone who truly appreciates the corralling system — meaning you put down your actual anticipated pace and start in the assigned corral — then you wouldn’t enjoy the type of start at the Central Park Half Marathon. Without corrals, you’re next to people of all different paces and if you rely on the person next to you or the crowds to help pace you to a more conservative start, well this would be tougher to gauge. Sometimes I’m that person and in the case of the race on Sunday, I was really concerned that I went out too fast and I might have a bit since my fastest mile was mile 4. Anyway, I ran a consistent race. My pacing was a little slower going up the tougher hills in Central Park – Cat Hill and Harlem Hill. It’s great knowing the course so well that you can expect the hills and adjust your pacing accordingly leading up to them. The course was not crowded so I really ran the race in my head, mentally free and did not have to worry about dodging people. The water stations were roughly every 2 miles, so that threw me a bit when I really wanted some water around the same time as a gel (by the way, the Honey Stinger Chocolate Energy Gels taste incredible especially if you love chocolate and when they’re cold – tastes like fudge!) towards the end and couldn’t remember when the next one was. As for the signage, I always run with a watch (for good or bad) so the mile markers and elapsed time clocks are a little less important to me but I usually prefer to look at them than down on my watch if I can help it. There were no elapsed time clocks in this race but there were mile markers. I saved a little gas for the last stretch as my second fastest mile was mile 13. Overall, I’m incredibly pleased on the outcome – 2:03:59. This is over 7 minutes off PR time but I wasn’t expecting that due to the lack of training and speed work but this time is faster than my first half marathon time and back then I was in the peak of marathon training. Now, if the LA Marathon was a half instead of a full, I might actually feel a little more confident! Post-race, NYCRUNS did a great job. There were heat sheets and medals and you can quickly navigate through all that. There were no bottlenecks between you and the food. I was able grab to a cup of Gatorade, bagel and my bag really quickly. I didn’t stop to enjoy but did notice a station with cream cheese for the bagels, hot chocolate, strawberries, and energy gels. All in all, I was pleased with the race experience and while it lacked the excitement of being able to run into so many people you know from the running community, it was low-key and easy. 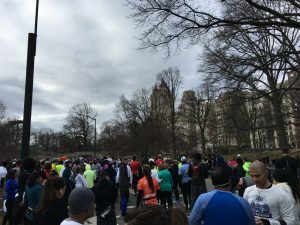 Tell me about your non-NYRR race experiences in the NYC-area. This entry was posted in Central Park, NYCRuns, race. Bookmark the permalink. I love NYC Runs because their races are saner than NYRR and they have much better bagels. Very true! Though I think the bagel from the Central Park Half was a little stale. Which is your favorite NYCRUNS race?